West Derby was once the centre of administration in the north west of England. As well as the seat of the Molyneux family, the township had its own castle and courthouse. 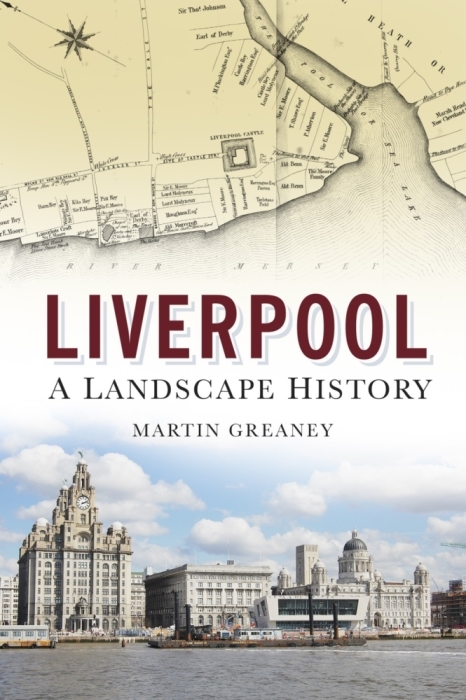 However, as Liverpool grew in importance, the district was overshadowed by its near neighbour, and evolved into a wealthy suburb in the 19th Century. Derbei, Domesday; West Derbie, 1177. The name comes from the word deor (deer), and the place-ending by, meaning enclosure, so this was a park where deer were bred for the purposes of hunting. The relative importance of this township can be told from the ‘West’ added to the name sometime after the Norman conquest, to distinguish it from Derby in Derbyshire. The land to the north of West Derby was once mossland, reflected in names like Blackmoor Drive, which derived its name ultimately from a large house of that name, and Blackmoor Moss which once covered part of the district. Later, the village grew up around the gates of Croxteth Hall, which remains the centre of West Derby village to this day. The township of West Derby was much more widespread than this, however, reaching close to the town centre, and taking in Kensington, and Prescot Road, one of the principal roads out of Liverpool. A portion of West Derby was taken into Liverpool in 1835, and another part in 1895. By 1907 there were still areas of West Derby which lay outside the city boundaries. In the early decades of the 20th Century West Derby was noted as having a long line of houses stretching all the way from the city centre to West Derby village, although the area was relatively green, with wide spaces between the buildings. To the south of Prescot Road ran another road from Liverpool. At the foot of the hill this divided, one towards Low Hill, the other branch continuing up the hill to a large open space called Greenfield. 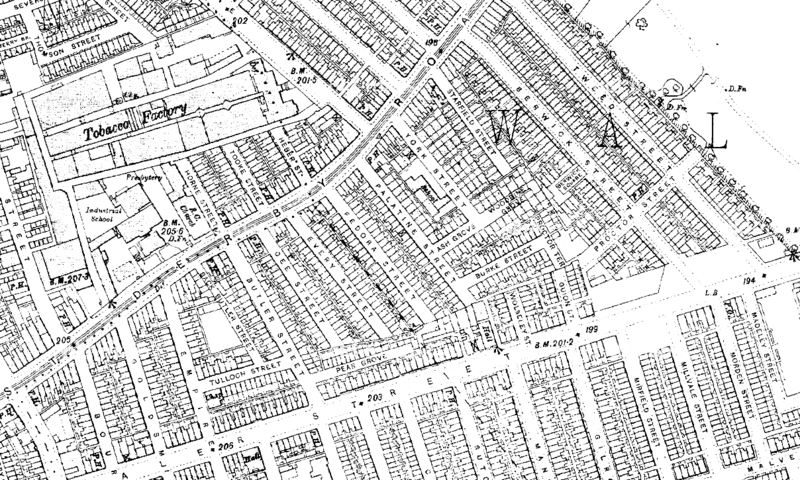 This then divided again, forming Edge Lane parallel to Prescot Road, while the present Wavertree Road led to Wavertree, with Wavertree Hall on the north side. Smithdown Lane was the other branch, leading south near the Liverpool/Toxteth boundary towards Allerton. To the north of Prescot Road ran Rake Lane (now known as West Derby Road). This formed the boundary with Everton, and crossed the Tue Brook and Green Lane. It led to the mill at the top of Mill Lane (leading to West Derby village). West Derby was the ‘capital manor’ of the hundred of West Derby, which stretched from the Mersey to the Ribble in the north. West Derby Castle, sited near St. Mary’s church in Meadow Lane, was probably built by Roger of Poitou in the late 11th Century, but had ceased to exist by 1297. 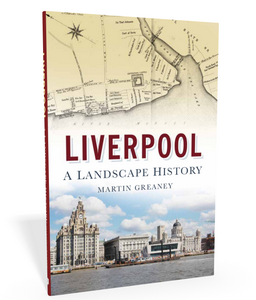 It had lost its importance at the time that Liverpool, with its own castle, had risen to prominence. Croxteth Hall was originally known as Barret’s Hall. The name of the Hall is drawn from the existing name of Croxteth Park, already in use at the time the name changed. West Derby Chapel was situated in the centre of the village, a space now occupied by a monument. It was first mentioned in the mid-14th Century. There was a free school in the village in 1677. The area now known as Old Swan gets its name from the pub of that name, once known as the Three Swans. Broad Green began life as a village around a wide green triangle. This area is now occupied by the Turnpike Tavern and housing estate to the south of Broadgreen Station. A ‘street railway’ was laid through Old Swan from Fairfield in 1861. The tram system from Liverpool served West Derby, terminating at the village, and also a junction at Knotty Ash which linked up with the South West Lancashire tram system. The London and North West Company’s railway travelled out from Liverpool Lime Street, via Edge Hill Station to the Crown Street terminus of the Liverpool to Manchester line. The railway had stations at Edge Lane, Tue Brook and Breck Road. The Cheshire Lines Committee railway ran to and from Southport, and stopped at Knotty Ash and West Derby stations. Knotty Ash was the location for a brewery. Acker’s mill and hall were converted into a farmhouse. Looking for a pub called the Whatesheaf at Walton on the Hill. My ancestors (well not that far back) ran that paub in c1731. It may not have been called that at the time but that’s all I have to go on. The name of my ggggg whatever he was is Ellis/Elias (?) Molyneux and his wife was called Martha Cropper. He was the innkeeper at the time. Could there have been that many pubs then?? I’ve not been able to find any info on a Whatesheaf pub, but thought it worth mentioning that there certainly were a fair number of pubs even back then. The problem is that Wheatsheaf and Whatesheaf are popular pub names even to this day, so narrowing down information is not easy! Good luck with your research, though. I’ll post something on the Historic Liverpool Facebook Page to see if anyone there knows something. Ellis Molyneux bapt.16.1.1712 at Up Holland,He was married at Walton-on-Hill (Walton Church) 2nd Jan 1730 to Martha Cropper, daughter of John Cropper, The register says he was ‘ of Everton’. He lived in the Fazakerleyl/Kirkby area and for many years was an Innkeeper. He was landlord of the “Wheatsheaf” in Kirkby in 1777. He and Martha had 5 daughters and 3 sons. All baptised at St Chads Kirkby, Ellen 1731, George 1735,Elizabeth 1737, Mary 1740, Hannah 1743, Margaret 1745, John 1747, William 1752-1811. Hello, I was wondering if anyone knows anything about the Barton family who lived in one of the two Waterworks Cottages (I think the Swinnertons lived in the other) on Green Lane, Old Swan. They were there for 2 or 3 generations (John, Arthur, then Cecil Barton) and were pipe layers and pumping engineers. Are the cottages still there? And I’d be really interested to know anything about the history of the waterworks and the importance of the water system to Victorian Liverpool. Thank you. While I can’t help with your cottages enquiry (maybe someone here or on the Historic Liverpool Facebook page can) there’s a blog post I wrote a couple of years ago about waterworks and the water supply in Liverpool, and how the Victorians revolutionised the supply and disposal of water in city. Hi AJ – would love to hear further from you – I was beginning to think I had dreamt my connection with the Barton’s at the Waterworks! Greetings Rowena, I have just come across your post whilst searching for background information on my wife’s aunt Emmie Swinnerton. It was her and her husband Stan Moore who lived next door. He was a Turncock with the water department for his entire career. The cottages had to be pulled down because they were in very poor condition then Emm was housed in a prefab in Childwall. I have a photo of the cottages somewhere and have been looking for it today. I don’t have any dates for the house moves except that they moved in to the waterworks cottage about 1935. My nan and grandad were married in West Derby, and they lived on Fedora Street. Would you be able to tell me where Fedora Street was? Fedora Street was just off West Derby Road, between the town centre and Tuebrook. You can see it on this map of about 1955. In earlier maps, when the roads where slightly different, Fedora Street seems to be named Division Street, and lies on the boundary of the City of Liverpool (hence the name). Click the map to see a larger version – Fedora Street is below the B in West Derby Road, six streets west of Sheil Park. I don’t know of any place called Mumford in West Derby, but there were a lot of houses with names instead of (or as well as) numbers, for example Lowlands on Hayman’s Green. I suspect it may have been one of these houses. The ones I know of were large houses, so your ancestor might have been either the owner of a very big property, or perhaps one of the house staff, who occasionally lodged with their employers. My mum lived in Lisleholmeroad no 5 west derby Liverpool. Her name is Margaret Stone, she has an brother named Norman. She immigrated to Holland in 1963 were she stills lives. Does anybody know her. Hi Linda, my parents lived next door to your grandparents at no 3.I do remember your mum coming regulary to visit with her children in the holidays.Sadly both mum and dad passed away several years ago and haven’t been to Lisle Holme for quite a while now. My grandmother’s maiden name was Blamphin and she came from West Derby. That is all I know of her background. She married John Walker and they lived in Rock Park, Rock Ferry, Birkenhead after the 2nd World War. Any more information on her would be gratefully receiced. Hello, could you please let me know when West Derby Village Hall was built and the year it opened. I would also like to know if the Hall was used for a village party to celebrate the end of the 1st World war and if so, what was the date it was held on? Hello. My family were the Duggans from West Derby. Does anyone have any information on the family? Hello, i’m researching my family tree and would be interested in any information regarding Elizabeth and Philip D’arcy. They lived in Rock Street Old Swan, which I believe was demolished. My understanding is Rock Street, had a name change from Rock Mount Street North, but no idea when. Does anybody know of a Cottrell family from West Derby, specifically Winnie who married Alfred Whittaker in the 1920s, please?